(CNN) -- The reality television show personality who accused football player Shawne Merriman of choking her over the weekend has denied that she was drunk during the incident, her Twitter page said Monday. Shawne Merriman is accused of restraining reality TV star Tila Tequlia as she tried to leave his home, police say. "I am allergic to alcohol," said the posting for Tila Nguyen, 27, who goes by Tila Tequila. "It has been publicly known for years. That is how I got the name Tila 'Tequila' cuz the irony. I can't drink." The incident began at 3:45 a.m. Sunday, when authorities responded to a disturbance call from Nguyen, the San Diego (California) County Sheriff's Department said in a statement. "Nguyen told deputies she had been choked and physically restrained by Merriman when she attempted to leave his residence," it said. Merriman, 25, was taken into custody on suspicion of battery and false imprisonment, the statement said. The San Diego Chargers linebacker released a statement Sunday noting that no charges had been filed and saying he had done nothing wrong. "I was concerned about her welfare given the intoxicated state she appeared to be in and I encouraged her to stay until safe transportation could be provided," Merriman said. "I in no way caused any harm to Ms. Nguyen, however, paramedics were called and she was examined but no injuries were reported." Merriman said he was looking forward to clearing his name of the "false accusations." Merriman's lawyer, Todd Macaluso, said Sunday that more than a dozen other people were at the house at the time, and "witness after witness after witness will back up his story 100 percent." In a statement posted on the Chargers' Web site Sunday, team General Manager A.J. 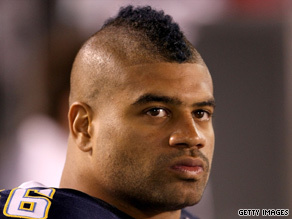 Smith said, "It is disappointing to hear about the issue involving Shawne Merriman. "We'll continue to monitor the situation and let the legal process run its course," Smith said. The 6-foot, 4-inch 265-pounder is entering his fifth year with the Chargers. The team begins its 2009 NFL regular-season campaign September 14 in Oakland, California, for a game against the Raiders. Merriman, a three-time Pro Bowl selection, recorded at least 10 sacks in each of his first three seasons, but he was limited to one game last season because of a knee injury that required surgery.